FILE - Selena Gomez . We’re counting down the five most popular songs in the Billboard Hot 100 Pop Singles chart, for the week ending October 3, 2015. It’s an active lineup this week! Not only do we get a new entry, but the championship changes hands as well - or does it? We'll explain in a few minutes; right now let’s meet our newcomers. Selena Gomez climbs two slots to fifth place with “Good For You,” her highest-charting Hot 100 single so far. On October 9, Selena drops her second solo album, Revival. She says the music will provide a glimpse into her life like never before…and hints it will also give some insight into her up-and-down relationship with Justin Bieber. 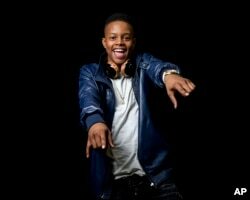 Rapper Silento, 17, poses for a portrait in New York, July 21, 2015. The Weeknd loses his singles title, as “Can’t Feel My Face” dips a slot to number three. This song has made its way into U.S. pop culture. Back in July, Tom Cruise performed this song in a “Lip Synch Battle” on The Tonight Show With Jimmy Fallon. It’s featured in the popular video game Madden NFL 16; Stevie Wonder performed it during an August 17 show in New York’s Central Park, and Spotify named it Song Of The Summer for 2015. Justin Bieber performs on NBC's "Today" show, Sept. 11, 2015. Rebounding a slot to second place is former champ Justin Bieber with “What Do You Mean?” Justin’s life is never without drama. On Sunday September 27, police in Melbourne, Australia were called to his recording studio, after a model said she was drugged at a listening party. Bailey Scarlett says something was slipped into her vodka and lemonade; the studio owner says he examined surveillance footage and could see nothing. The Weeknd performs at Day 2 of the 2015 iHeartRadio Music Festival at the MGM Grand Garden Arena, Sept. 19, 2015, in Las Vegas, Nevada. Can The Weeknd keep it going? We’ll find out in seven days!